Imagine using a dump site to produce a fuel resource. Due to a novel technology developed by a company called BlueFire Ethanol, the cellulosic ethanol within municipal and other waste products could be transformed into an alternative fuel resource. The company has patented a process dubbed “Arkenol” that currently stands as the sole viable cellulose-to-ethanol technique. According to BlueFire, production could be implemented with ethanol coming from wood wastes, urban trash (post-sorted municipal solid waste), rice and wheat straws, and other agricultural residues. BlueFire estimates a production of 3.7 million gallons of cellulosic ethanol per year from its first cellulosic ethanol plant which will be built in Lancaster, California. A commercially-ready and patented concentrated acid hydrolysis technology would be introduced to convert the cellulosic waste consisting of non-foodstock urban, forestry, and agricultural residues. The company also states that this form of ethanol is entirely renewable and economically equivalent to gasoline. Moreover, the hydrolysis technology is exceptionally adaptable as it has the capability to manipulate different types of feed stocks and thus create final products of varying characteristics. BlueFire’s brute force approach allows the process to convert nearly all types of cellulosic feed into fermentable sugars, which can then be employed to manufacture ethanol or one of the 140 higher value fermentation chemicals, such as citric acid, lactic acid, or butanol. The process derives itself from techniques commonly utilized during World War II and requires no diluted acid pre-treatments, fermentation inhibitors, or enzymes to assist development. 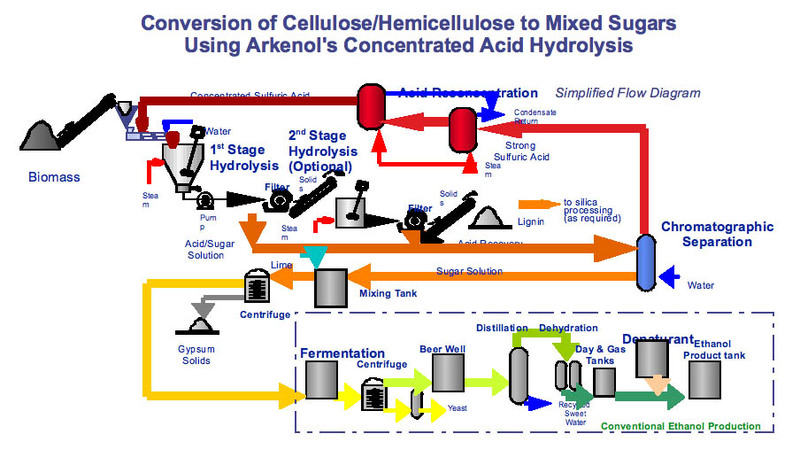 The process begins with acid hydrolysis by separating cellulose and hemicellulose from lignin using sulphuric acid. A suitable analogy would be where the cellulose and hemicellulose are the main building blocks of plant life and lignin is the glue that binds these building blocks together. The process then transforms the cellulose and hemicellulose into sugars, which are fermented and purified into products, while the lignin is used as fuel to generate steam to power the boilers, as there is no power plant. Once the cellulose and hemicellulose have been separated from the lignin, the material is in the form of an acid-sugar solution. This solution is then processed through a chromatographic separation that employs ion exchange resins to divide the fragments without diluting the sugar. This process results in a sulphuric acid and a sugar solution. The sugar is then fermented at the ethanol production plant. For the fermentation process, natural yeast, nutrients, and the sugar solution are combined to produce fermented beer and carbon dioxide. A centrifuge separates the yeast culture, which is then channelled back into the fermentation tanks. The fermented beer is then separated to produce ethanol through conventional distillation technology, dehydration to 200 proof with conventional molecular sieve technology, and denaturation with unleaded gasoline. The by-products from the processes consist of mainly water and unfermented pentose sugar, both of which are channelled back into the process. TFOT has previously written about the petrol excreting bugs that are carbon negative, meaning that the carbon they emit will be less than that sucked from the atmosphere by the raw materials from which it is made. You can also check out our articles about an open-source renewable energy that aims to create a new power plant design using a combination of solar and geothermal energy, and sugar-powered batteries by Sony, that generate electricity from carbohydrates (sugar). Additional information on this renewable ethanol energy can be obtained at BlueFire’s website.